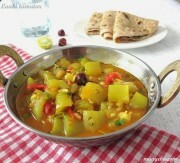 Pressure cook bottle gourd with 1/ 2 cup water for 1whistle only. 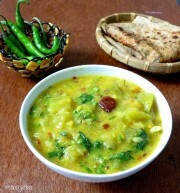 Drain and let it cool down,then squeeze the water from the bottle gourd(reserve the water to use in the gravy). Take bottle gourd in a bowl and add gram flour,corn flour,salt,chili powder,pinch of garam masala,1/ 2tsp grated ginger,and chopped raisins. Mix well and make walnut size smooth and round balls. Deep fry in hot oil on medium flame till golden in colour,drain and keep aside. 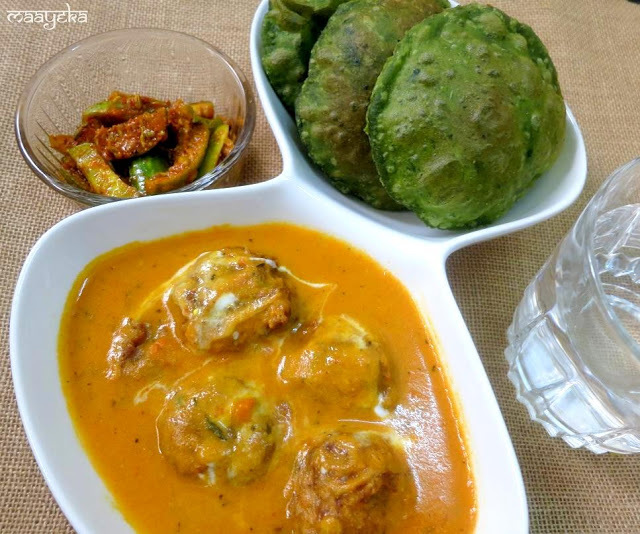 GRAVY-Blanch the tomatoes and then grind with 2 green chilies,cashew pieces and ginger and make a smooth puree. Heat oil in a pan and add cumin seeds,when start crackling then add tomato puree and saute for approx 2- 3 minutes on medium flame. Now add turmeric,chili powder,salt,coriander powder and mix well and cook for few seconds. 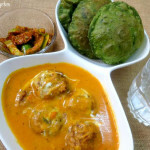 Cook for approx 5 minute on low flame,now add koftas and cook for a minute OR arrange the kofta in the serving dish and pour hot gravy over them. 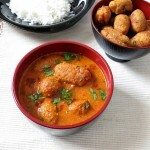 Inviting spread, wonderful kofta curry. Ver tempting and lovely …love the puris behind too. Looks very delightful and appealing. 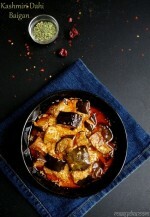 very eye catching the dishes are and ofcourse yummy. Love the whole platter… Can i come over sis??? Too too yummm!!! Love the gravy…Bookmarked!!! lovedd ur description.. i lost my mom real early, and my blog was indeed to record all my struggles, and i have come a long way .. REspect! Couldn't take my eyes off the awesome spread of dishes.. Curry looks delicious and inviting.